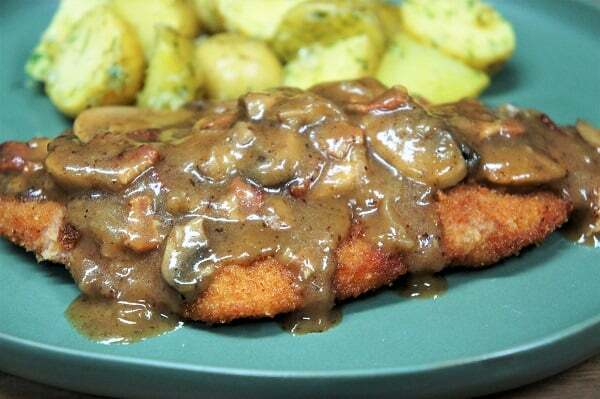 This Pork Schnitzel & Mushroom Gravy is a delicious meal that’s worthy of a special occasion. This is a variation of classic pork schnitzel, it starts the same way but then it’s covered with a mushroom gravy. In this recipe, pork loin chops are pounded thin, breaded and fried until they’re juicy on the inside, and golden brown on the outside. 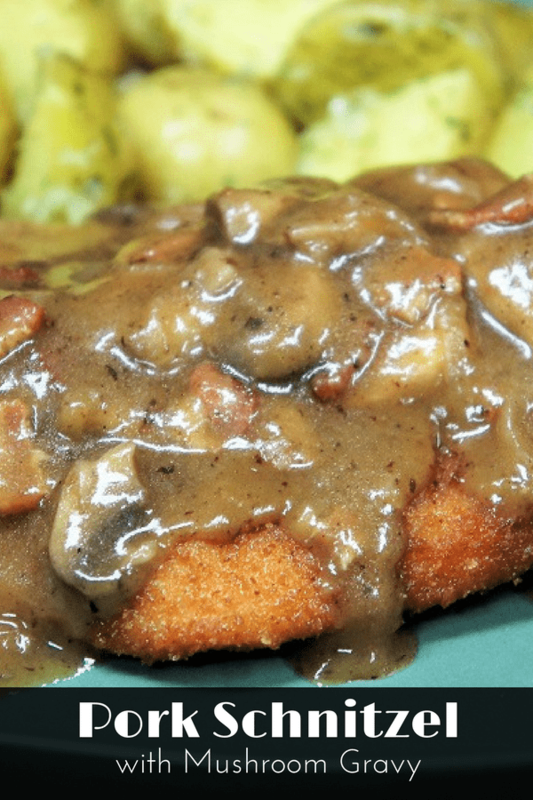 Then the pork schnitzel is served with a flavorful bacon and mushroom gravy. Enjoy! Pound each pork piece to roughly ¼ inch thick, season the pork on both sides using about 1 tsp. of salt and a pinch of pepper. Set aside. Set up a large sheet pan or two plates, one side with the flour, and one side with the bread crumbs. Sprinkle both the flour and the breadcrumbs with a pinch of salt and stir with a fork. Beat the eggs in a medium bowl using a fork or whisk, season with a pinch of salt and set aside. Lightly coat the pork in the flour and shake off any excess. Then, dip the pork into the egg bowl, making sure the entire piece is moist, shake off any excess. Next, place the pork in the bread crumbs, and ensure the entire piece is completely coated, shake off the excess. Set the breaded pork aside on a clean, dry pan and repeat with all of the pieces. If stacking, place a piece of parchment paper between the breaded pork pieces to prevent them from sticking to each other. Cover the bottom of a large, deep skillet with about a ¼ of an inch of oil. Heat the oil over medium-high. Fry the pork steaks, two pieces at a time, for about 2 minutes per side until golden brown (use tongs to turn the pork so the breading does not flake off). 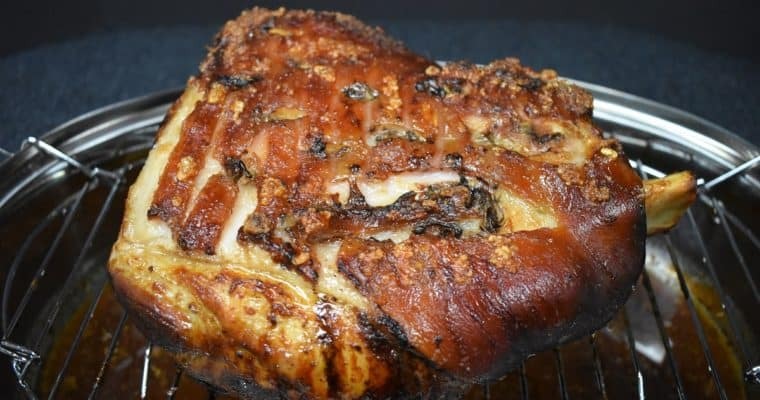 Remove the pork from the skillet and place it on a baking sheet that is lined with a cooling rack. This will prevent the bottom of the schnitzel from getting soggy. Place the baking sheet in the preheated oven to keep the pork schnitzel warm while you cook the remaining pieces. Make sure the internal temperature of the pork, at its thickest part, is at least 145°F. Keep the pork schnitzel in the warm oven until ready to serve. Don’t slice the mushrooms too thin or they’ll break apart when you cook them. You want nice hearty pieces in the mushroom sauce. Add the bacon to a large skillet over medium heat. Cook the bacon until crispy, about 7-8 minutes, stirring frequently. Remove the bacon from the skillet using a slotted spoon and set on a plate lined with a paper towel to drain. When it’s cool enough to handle, crumble and set aside. Do not wash the skillet. Leave 2 tbsp. of the bacon drippings in the skillet, drain the rest. Add the sliced onions to the skillet and cook gently over medium heat for 2 minutes until they’re translucent, stirring frequently. Add the sliced mushrooms to the skillet. Cook the mushrooms for 2 minutes, stirring frequently until they start to turn golden in spots. Add the butter, when it melts, sprinkle the flour over the mushrooms, stirring well to combine. Cook the flour for about 1-2 minutes stirring almost constantly. Slowly add the beef broth to the mushroom mixture while stirring gently and scrapping the bits off the bottom of the pan. Add the Worcestershire sauce and stir. Bring the mushroom sauce to a simmer lower the heat to medium low and cook 7-10 minutes until thickened, stirring occasionally. Keep the sauce at a simmer, if it’s boiling too vigorously, lower the heat a bit, if not simmering raise the heat a bit. Stir in the crumbled bacon and black pepper. Taste the mushroom sauce and add salt only if needed. Note: Don’t’ add salt to the mushroom sauce before you taste it, it may not be needed. 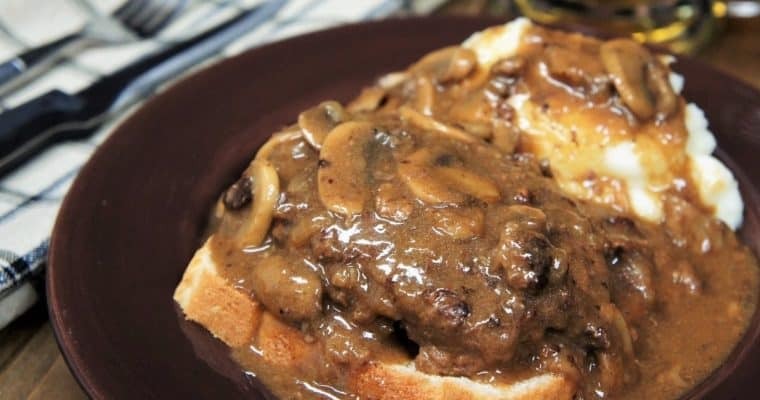 Lower the heat to low and keep the mushroom sauce warm until ready to serve. Stir occasionally. Serve the Pork Schnitzel & Mushroom Gravy and enjoy!